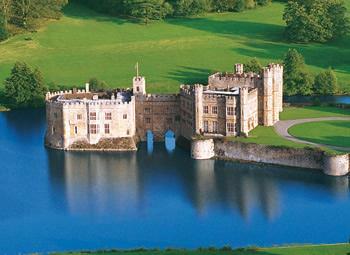 Leeds Castle is located south of Maidstone 15 miles from Tonbridge. The castle is one of the most popular tourist attractions in the south east and on a sunny day is certainly one of the most beautiful castles in the country. This Norman castle constructed on the site in the 12th century was given to Edward I in 1278 . He carried out major alterations, building a set of outer walls, a barbican and D-shaped tower on the smaller of the two islands. This tower known as the 'gloriette' was extensively altered during the Tudor period. The castle passed from royal hands in 1552 when it was given to Sir Anthony St Ledger by Edward VI. The castle has been continuously inhabited since then and its present appearance is the result of centuries of rebuilding and improvements. The garden and 500 acres of parkland was designed by Capability Brown. Open all year. Closed 8-9th Nov and Christmas Day 2008. Castle closed 3rd Jul. Oct-March 09: 10:00-17:00 daily last entry 15:00 Castle 10:30-16:00 last entry 15:30. Have you been to Leed Castle, how was it? Would you recommend it?